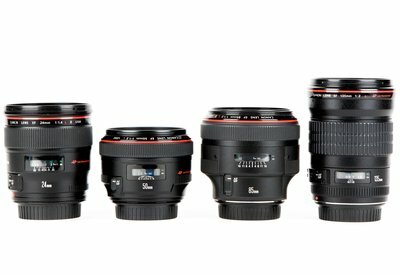 If you're thinking of venturing into prime lens shooting, this is the kit that will give you the full experience. This setup differs from the three prime kit by adding in the venerable 135mm f/2L giving you that super creamy bokeh that wedding clients love. The primary advantages of shooting prime lenses are their optical quality and fast maximum apertures. With these fast lenses you'll have tremendous control over depth of field and uncompromising image quality. These lenses are perfect for shooters who perfer to be more upclose and personal with their subjects. This package is also fantastic for portrait or event photographers!